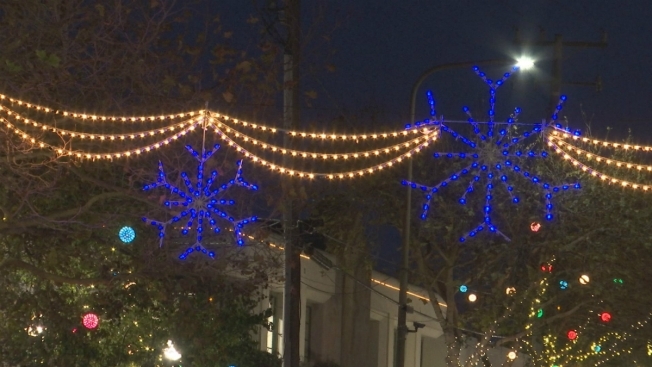 Berkeley's Fourth Street is lighting up every night for the holiday season. The sparkling baubles and snowflakes lit up for the first time on Friday at dusk, while merchants gave away free coffee, tea and cider to people strolling by. Pjay Smik Smak & the Cliffnotes played mellow jazz while toddlers looked on. Sara Feinberg, manager of Market Hall Foods, said the holiday season is important for her business, which sells specialty gourmet items and lots of gift baskets at the end of the year. Her store stocks up and hires extra help during the holidays. Feinberg showed off a super-sized panettone - enough to feed a massive holiday party. She said traditional European Christmas breads are always popular as gifts, as well as truffles and charcuterie. "It's the most festive place in the East Bay, so it brings a slew of families to the area to stroll during the evening," Feinberg said. "It's a great destination shopping place during the day. Then at the end of the day you come here when the lights turn on to have a meal and it's very enjoyable." Starting on the day after Thanksgiving, Fourth Street will have extended store hours on Fridays and Saturdays, and valet parking on Fridays and weekends.